At a conceptual level, I navigate this city by rail more than by road. For instance, if I’m trying to focus on rain around home, the proximity to railways is far more useful to me than the proximity to major roads. 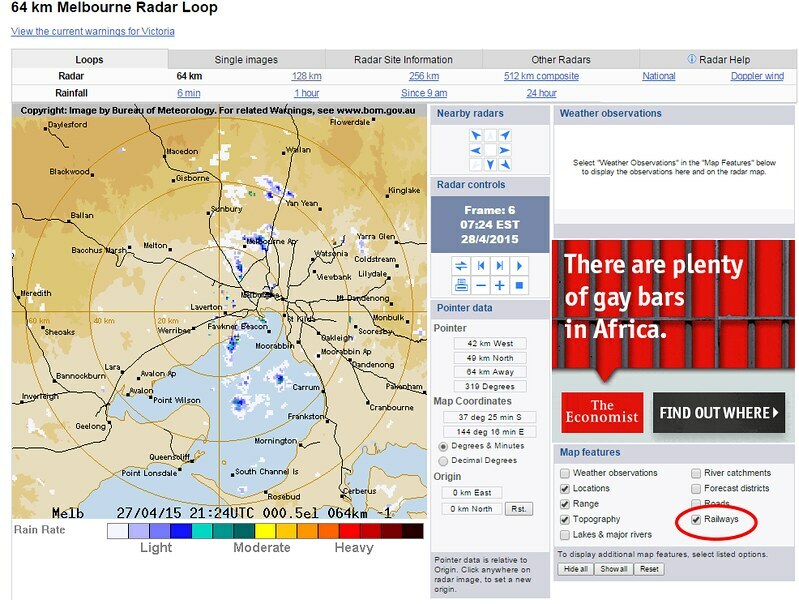 So to make the Bureau of Meteorology’s rain radar map more useful to me, I switch off roads, and switch on railways instead. If only more digital maps were customisable like this. The technology exists now to have these options. It’s a shame BoM is one of the few that offers it. Extra brickbats for the otherwise wonderful Google Maps — when zooming in to see road/street detail, their algorithm seems often reluctant to tell me the name of major roads — instead telling me all about the minor streets surrounding them. It might be because it likes showing State Route numbers (which almost nobody uses) — in this example, it’s not just Centre Road (state route 16) which is unlabelled, but also Jasper Road (state route 17, but it’s not even showing that). In any case, the core point is this: Most maps are digital these days. Why don’t they have the options to show and/or highlight what I want them to show? As I said back in April, I really like this new design, which better represents how the rail network operates. Sandringham line at an angle which better reflects geographic reality, rather than implying it runs into the middle of the bay! The earlier one had an airport indicator at Southern Cross, which some people claimed was confusing. It’s goneski. Some people have complained it doesn’t allow space for the Doncaster line. I reckon if that’s the worst problem, that’s not saying much — unfortunately neither side of politics is saying they’ll build it anytime soon… ditto Rowville. It does have space for two that are more likely to get up in the near future: Airport (Coalition), Mernda (Labor)… though the designers may have to do a bit of fiddling to get either rail tunnel scheme in. What do you think? Leave a comment here or on the PTUA’s Facebook page — they will be passed back to PTV. This document outlines some of the changes to the new train map that have been made as a result of public consultation and feedback. The new map is proposed to be introduced in 2015 when Regional Rail Link Stations at Wyndham Vale and Tarneit are opened. Feedback is sought on this revised version so further improvements can be made. Feedback on the new map has generally been positive. to be more geographically accurate following customer feedback. Feedback indicated that using a dotted line to indicate direct services from Glen Waverley to Flinders Street was confusing. 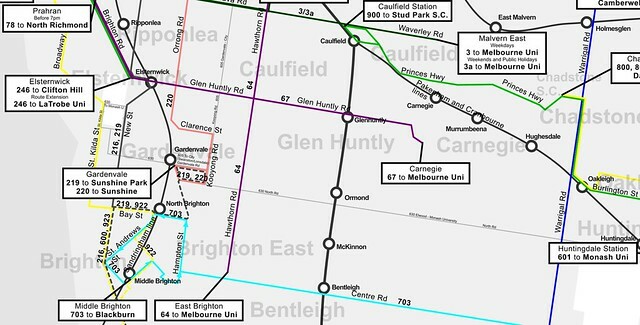 In this version Glen Waverley has been given its own line colour. It is usual that Glen Waverley trains operate direct to Flinders Street, but generally return to Glen Waverley via the loop in the afternoons and on weekends. This information has been included in the key. The dotted line at Camberwell to represent peak hour Alamein trains travelling to/from the city was viewed as being misleading and has been removed, replaced with a note in the key. This map will be primarily used by occasional users, and reflects that passengers traveling from the city to Alamein will normally need to change at Camberwell. The new Regional Rail Link stations have been shown in this version. The special events line has been lightened to avoid giving the impression that it operates all the time. The boundary of the metropolitan area (Zone 1+2) has been indicated by little triangles – so that passengers can see the boundary of the metropolitan fare (which will be a maximum of a Zone 1 fare from 1 January 2015). Transfer points between V/Line and Metro service have been revised to reflect where transfers are more likely to occur. The designation for the Stony Point line has been changed to make it clearer that the service is operated by Metro. The line has been kept in grey as the line is operated by trains branded with V/Line and the service level provided is more consistent with a V/Line service than other Metro lines. The Airport bus designation at Southern Cross was perceived by some users to be confusing and this has been removed. There is now clearer designation of the boundary of the myki area on V/Line services. Feedback indicated people preferred the boundary to end at a station rather than between stations. 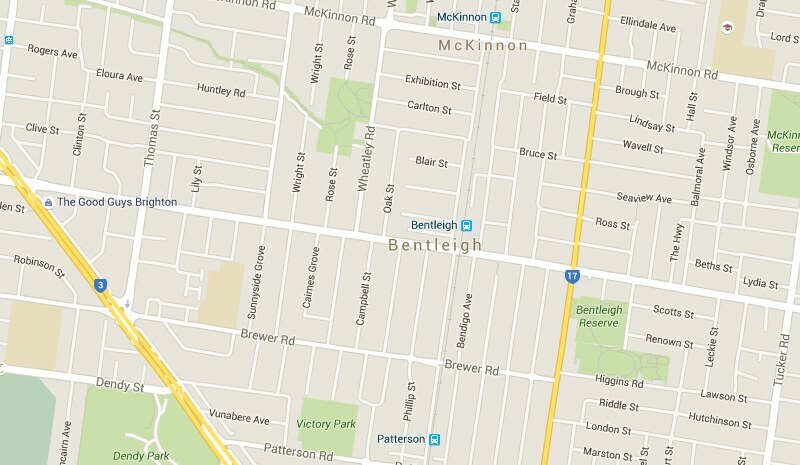 East Richmond is shown on the Glen Waverley Line even though some Lilydale/Belgrave trains do stop there. In the long term, it is intended that East Richmond will be exclusively a Glen Waverley Line station. When Regional Rail Link opens, the V/Line service running parallel with the Werribee Line will be removed and the map will reflect this. This may provide the opportunity to improve the design of the Werribee Line, including swapping certain station names to the other side of the line. Consideration was given to including Overland stations but this was decided against as the product provided to customers differs from that offered on V/Line. There are two Overland services between Adelaide and Melbourne per week in each direction. It is not proposed to include tourist railways. While bus and tram connections are not proposed to be shown on this map, it is intended that electronic versions of the map will be display connecting bus and tram services when customers select a particular station. This map is designed to be part of a suite of products for customers. Local area maps that show train, tram and bus services will be improved to assist passengers making multi-modal journeys. Line diagrams for each line, based on the colours shown in the new map, will include a range of information that cannot be easily shown on a network map. The map is intended to show the network as it will exist from 2015 and does not include proposed train stations or train lines that will not be completed by this time. Consideration was given to showing loop directions. At present only the South Morang/Hurstbridge Loop has been altered to operate clockwise seven days a week. When more loops are altered to operate in a consistent manner, then loop direction will be included on the map. PTV are trialling a new train network map. They’re seeking feedback on it, and you’ll see it at some stations now (Bentleigh, Malvern and Moorabbin, I think). 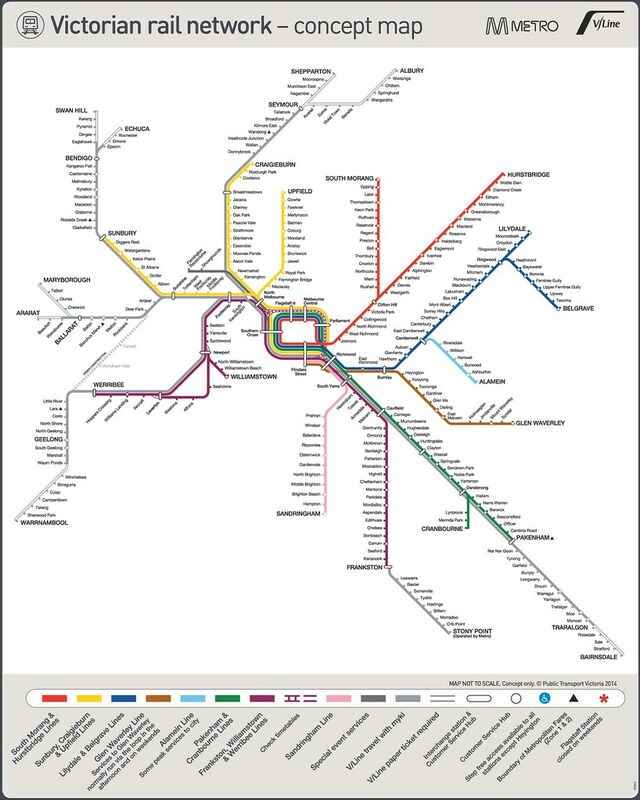 Note, just to remove all doubt: unlike the PTV network plan, it’s not a concept for new rail lines; it’s a prototype of a map of the existing network. My initial impression: I quite like this. Colour-coding the lines helps make sense of the way the network actually runs (or will run in the near future). It allows them to add detail such as the stations usually skipped by expresses on particular lines, which lines run via the City Loop, and which sections run as shuttles. This helps people navigate — for instance if you’re coming from the Dandenong line going to Armadale, you’ll probably have to change trains at Caulfield. The caveat here is that the train network is not currently operated consistently. Loop operations (even leaving direction aside) are very confusing. Express stopping patterns are all over the place on some lines. The Frankston and Newport lines are connected… but only on weekdays. The operational variations on the various lines might need some work. See the difference between Williamstown and Alamein, for instance; potentially confusing. 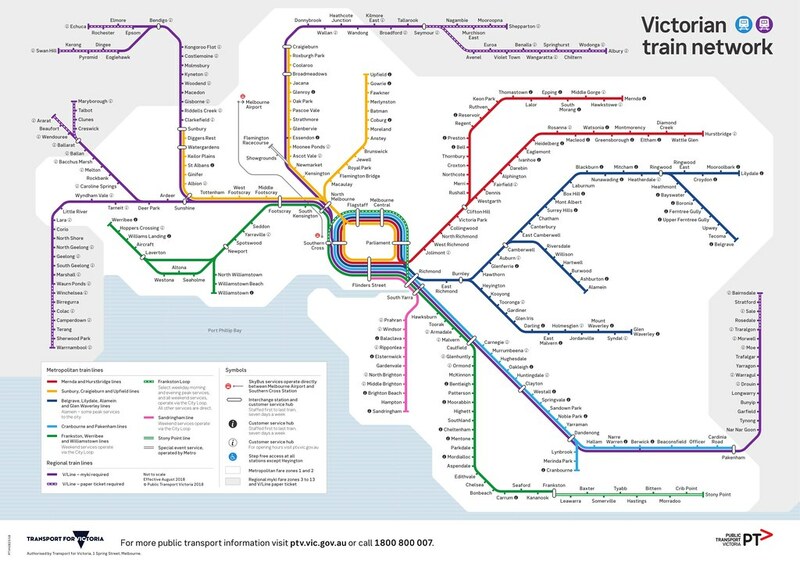 A big difference is this map also adds V/Line services. With Myki now phased-in for short-distance (commuter-belt) V/Line services, one barrier to city people using them (the need to buy a separate ticket) is gone. This is an interesting move. It does take extra space, thus makes everything smaller — is the benefit worth it? The part-time Flemington Racecourse line is shown prominently in black. I suppose that’s a good (for occasional users) and bad (implies it’s fulltime). I’m told it’s showing terminating at Southern Cross because that’s how it’s likely to be (at least on weekdays) in the near future, due to rail viaduct capacity issues, so they’d rather encourage people to change there instead of Flinders Street. Somehow the order of lines shown at Flinders Street seems wrong, but I think that’s because I know Glen Waverley direct services don’t actually terminate next to Sandringham services. The Skybus connection is shown, but the Broadmeadows to Airport Smartbus connection isn’t. Neither are the 401 and 601 university weekday high-frequency shuttles, specifically designed to connect to the rail network. In the first version of the map that got out in the wild over the weekend, there were at least two errors: Violet Town and Euroa had been transposed, as had Ballan and Bacchus Marsh, and the colours indicating Myki validity had crept beyond where they should have. The stations have now been corrected (though Myki still creeps beyond Wendouree, Eaglehawk, Marshall and Traralgon) and PTV expect to do quite a few more tweaks over coming months as a result of feedback. 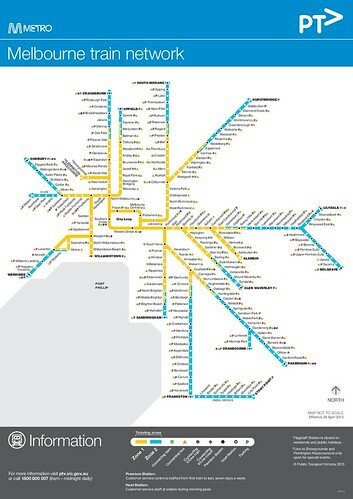 They don’t expect a more general rollout of the map until Regional Rail Link opens next year. It costs a small fortune apparently. But what’s wrong with the current train map? It doesn’t show where the lines go. Someone unfamiliar with Melbourne might assume there’s a line from Sunbury to Upfield, for instance. And it doesn’t show any operational detail; the map implies all trains run via the Loop, for instance. It gives little hint as to where the best places to change trains are. Meanwhile, we’re losing two-zone trips next year, so there won’t be a huge need to show zones as at present. The new map started being designed well before this, but it’s good to be able to take advantage of it to show other useful detail. I think the new map is a good step in the right direction. But if they’re starting to mix things up on a map (Metro and V/Line), I think another thing they should be looking at is showing the network frequent trams and buses that back up the train network… though of course, that would be a much more complicated and difficult visualisation to get right. People traveling along FTN (Frequent Transit Network) corridors can expect convenient, reliable, easy-to-use services that are frequent enough that they do not need to refer to a schedule. For municipalities and the development community, the FTN provides a strong organizing framework around which to focus growth and development. The train-only network map is still useful — good for showing the mass transit, backbone of the public transport network. 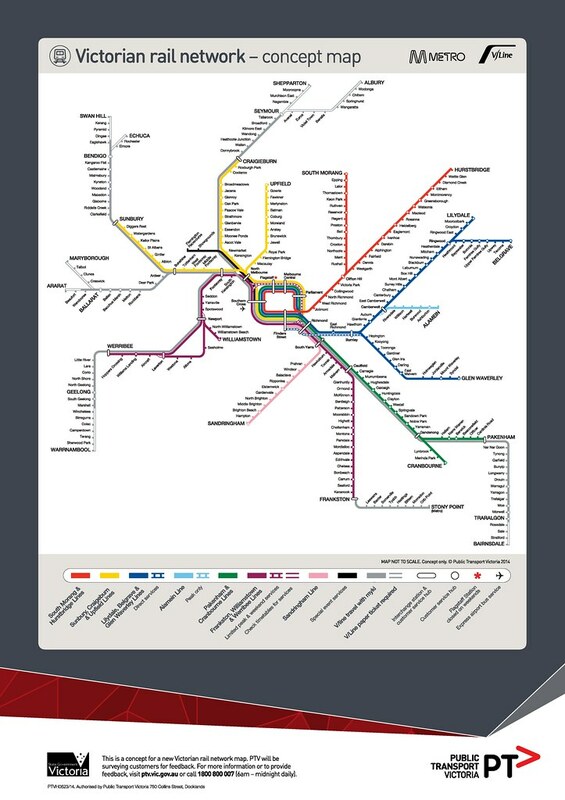 But a frequent network map would be great for showing all the places you can easily get to in Melbourne on public transport — which is a lot more than just the rail network. Are maps even in important? Sure they are. Good maps mean people can navigate their way around more easily, so they’re more likely to use the system. More passengers means more impetus to keep upgrading services. But this is about more than just a map. 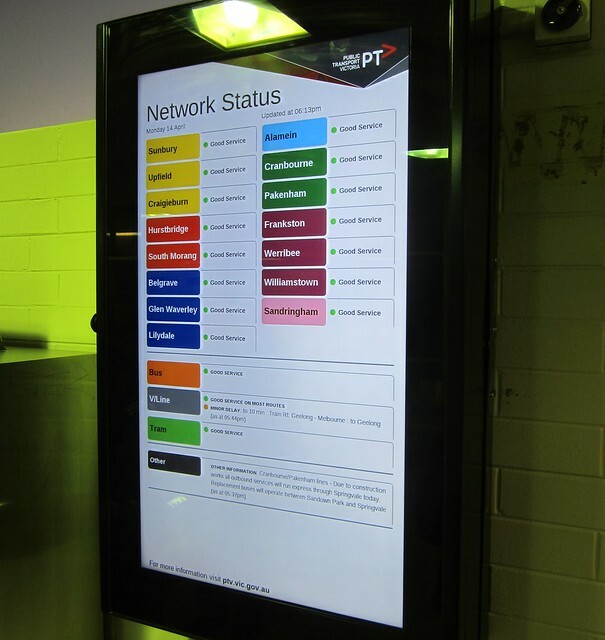 Related is the trial rollout of “rainbow” network status boards, installed this week at Moorabbin, Bentleigh, Malvern, and in the PTV Hub at Southern Cross. The colours on the board match those on the new map… including Alamein, which has a distinctive colour on the map to draw attention to the fact that you usually have to change at Camberwell. It’s a little early to judge these, though I note that they don’t show next train departures — this is present on other displays at Malvern, but not at Moorabbin and Bentleigh and most other stations. I’m told they can modify the design based on feedback, so it’ll be interesting to see how this evolves. One issue I think is that line-specific info is shown at the bottom — only a “traffic light” indicator is shown at the top, which means the information you need may not be easy to find. I’d hope that once these boards are running well, they roll them out quickly to the bigger interchange stations, where they’re likely to be most useful. Both the map and the status board are part of measures to standardise train operations: the slow move towards more predictable routes, consistent stopping patterns, consistent platforms at the larger stations, and “metro”-like frequent operation on dedicated tracks. And there are also moves to improve the flow of information from operators (on all modes) through to PTV so a better view of the overall network is available, including online. Clearly they’ve got a long way to go, but this is a step forward. You might recall I did a recent poll on three public transport questions. I posted about the first two here. Frequent public transport services are an order of magnitude more useful to people than infrequent ones. Nobody likes to live their life by a timetable, and frequent services allow you to turn up at the stop/station and go within a few minutes. They make connections easier because you don’t have to rely on timetable co-ordination (which is difficult to provide, and risky to rely on). In short, a network of frequent services helps public transport provide the kind of freedom that the car provides. And having a map of these services helps people see where they can go easily in a city, without first having to look at a timetable. Just as people look at maps of freeways and arterial roads to see which way they can easily drive to things, many Melburnians already use tram and train maps to see what’s easy to get to by PT… because, as a rule, trams and trains offer reasonable services, while buses don’t. Reality is a bit more nuanced than that. Having a map of all frequent services would be a good way of seeing which trips are easy by PT, and would be of particular help for those who have the choice to drive, but will decide not to drive if the alternative is quick and easy. 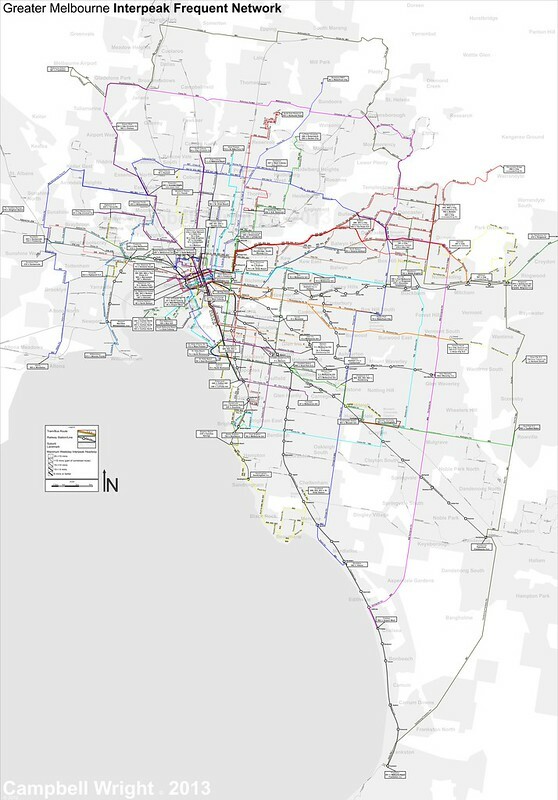 PTV publishes no such map, and last I heard, were reluctant to do so. Apparently they did some research and concluded it wasn’t worth it. This makes it difficult to find such information other than via looking for specific routes and using the trip planner. To draw a web analogy, you can search but not browse. My little survey made it clear that most respondents would like to see a frequent service map. Campbell Wright has designed such a map. It first appeared on the Human Transit blog late last year. His original version showed everything running at least every 15 minutes in the weekday interpeak period — but left off everything else — which unfortunately included most of Melbourne’s train lines. This revised version includes services running every 20 minutes, but in grey. It leaves off less frequent services. The various routes are shown by frequency, with the thicker lines being more frequent. Oh, and it’s to scale. As you can see from this excerpt of the middle-southern suburbs (my area) there is a grid of frequent routes reaching most suburbs, but some big gaps between the routes. If you want to travel north-south anywhere between the Frankston line and Warrigal Road, you’ll be stuck with 30-60 minute buses. Campbell is keen to get comments. I think my only niggle with the design is that I’d probably have included all Metro train services… their speed and capacity (even when they only run every 30 to 40 minutes on the outer sections) makes them perhaps worthy of a thin grey line at least. I’m also torn on the scale. At present it does clearly show the big gaps in the frequent network, but making it to scale has also meant to cover the entire metropolitan area takes up a lot of space, limiting its practicality. But I love the idea, and it’s a great effort. This map is really a great effort to highlight where in Melbourne you can get without too much trouble without a car. There’s been almost zero promotion of Melbourne’s most frequent PT… it’s about time it started. PTV really need to stop pretending that people will just magically find out about upgrades and start using them. A widely distributed frequent service map could help a lot.